The start of a new era…. Therefore, as of the 28th October 2018 all three of our parishes will cease to exist as separate parishes, but will remain as three individual Churches under the united parish patronage of The Most Holy Trinity. Devotion to the Seven Sorrows of Our Lady has its roots in Sacred Scripture and in Christian piety, which always associates the Blessed Mother with her suffering Son. 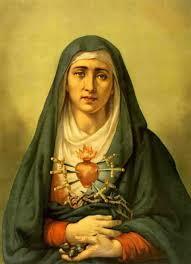 Today’s feast was introduced by the Servites in order to intensify devotion to Our Lady’s Sorrows. In 1817 Pius VII — suffering grievously in exile but finally liberated by Mary’s intercession — extended the feast to the universal Church. This feast dates back to the 12th century. It was especially promoted by the Cistercians and the Servites, so much so that in the 14th and 15th centuries it was widely celebrated throughout the Catholic Church. In 1482 the feast was added to the Missal under the title of “Our Lady of Compassion.” Pope Benedict XIII added it to the Roman Calendar in 1727 on the Friday before Palm Sunday. In 1913, Pope Pius X fixed the date on September 15. 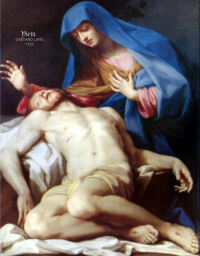 The title “Our Lady of Sorrows” focuses on Mary’s intense suffering during the passion and death of Christ. “The Seven Dolors,” the title by which it was celebrated in the 17th century, referred to the seven swords that pierced the Heart of Mary. The feast is like an octave for the birthday of Our Lady on September 8th. This feast is dedicated to the spiritual martyrdom of Mary, Mother of God, and her compassion with the sufferings of her Divine Son, Jesus. In her suffering as co-redeemer, she reminds us of the tremendous evil of sin and shows us the way of true repentance. May the numerous tears of the Mother of God be conducive to our salvation; with which tears Thou, O God, art able to wash away the sins of the whole world. This feast was observed in Rome before the end of the seventh century. It commemorates the recovery of the Holy Cross, which had been placed on Mt. 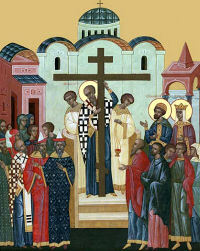 Calvary by St. Helena and preserved in Jerusalem, but then had fallen into the hands of Chosroas, King of the Persians. The precious relic was recovered and returned to Jerusalem by Emperor Heralius in 629. The lessons from the Breviary tell us that Emperor Heraclius carried the Cross back to Jerusalem on his shoulders. He was clothed with costly garments and with ornaments of precious stones. But at the entrance to Mt. Calvary a strange incident occurred. Try as hard as he would, he could not go forward. Zacharias, the Bishop of Jerusalem, then said to the astonished monarch: “Consider, O Emperor, that with these triumphal ornaments you are far from resembling Jesus carrying His Cross.” The Emperor then put on a penitential garb and continued the journey. 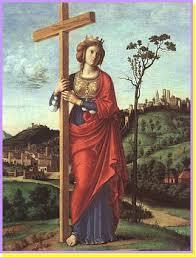 This day is also called the Exaltation of the Cross, Elevation of the Cross, Holy Cross Day, Holy Rood Day, or Roodmas. The liturgy of the Cross is a triumphant liturgy. When Moses lifted up the bronze serpent over the people, it was a foreshadowing of the salvation through Jesus when He was lifted up on the Cross. Our Mother Church sings of the triumph of the Cross, the instrument of our redemption. To follow Christ we must take up His cross, follow Him and become obedient until death, even if it means death on the cross. We identify with Christ on the Cross and become co-redeemers, sharing in His cross. We made the Sign of the Cross before prayer which helps to fix our minds and hearts to God. After prayer we make the Sign of the Cross to keep close to God. During trials and temptations our strength and protection is the Sign of the Cross. At Baptism we are sealed with the Sign of the Cross, signifying the fullness of redemption and that we belong to Christ. Let us look to the cross frequently, and realize that when we make the Sign of the Cross we give our entire self to God — mind, soul, heart, body, will, thoughts. O cross, you are the glorious sign of victory. Through your power may we share in the triumph of Christ Jesus. St Cuthbert was a Scot. Orphaned when a young child, he was a shepherd for a time, possibly fought against the Mercians, and became a monk at Melrose Abbey in the Borders. In 661, he accompanied St. Eata to Ripon Abbey, which the abbot of Melrose had built, but returned to Melrose the following year when King Alcfrid turned the abbey over to St. Wilfrid, and then became Prior of Melrose. Cuthbert engaged in missionary work and when St. Colman refused to accept the decision of the Council of Whitby in favor of the Roman liturgical practices and immigrated with most of the monks of Lindisfarne to Ireland, St. Eata was appointed bishop in his place and named Cuthbert Prior of Lindisfarne. He resumed his missionary activities and attracted huge crowds until he received his abbot’s permission to live as a hermit, at first on a nearby island and then in 676, at one of the Farnes Islands near Bamborough. Against his will, he was elected bishop of Hexham in 685, arranged with St. Eata to swap Sees, and became bishop of Lindisfarne but without the monastery. He spent the last two years of his life administering his See, caring for the sick of the plague that decimated his diocese, working numerous miracles of healing, and gifted with the ability to prophesy. He died at Lindisfarne. St Cuthbert is co patron of our Archdiocese. St. Gregory, born at Rome about the year 540, was the son of Gordianus, a wealthy senator, who later renounced the world and became one of the seven deacons of Rome. After he had acquired the usual thorough education, Emperor Justin the Younger appointed him, in 574, Chief Magistrate of Rome, though he was only thirty-four years of age. After the death of his father, he built six monasteries in Sicily and founded a seventh in his own house in Rome, which became the Benedictine Monastery of St. Andrew. Here, he himself assumed the monastic habit in 575, at the age of thirty-five. After the death of Pelagius, St. Gregory was chosen Pope by the unanimous consent of priests and people. Now began those labours which merited for him the title of Great. His zeal extended over the entire known world, he was in contact with all the Churches of Christendom and, in spite of his bodily sufferings, and innumerable labours, he found time to compose a great number of works. He is known above all for his magnificent contributions to the Liturgy of the Mass and Office. He is one of the four great Doctors of the Latin Church. He died March 12, 604. He is the patron of teachers. Below is the record of the meeting which was held on Wednesday 13th June at 7.00pm in St Peter in Chains Hall, Inverkeithing. Also attached is a copy of the letter that Fr Kevin sent in response to the Archbishop with the outcome of the meeting. Let us pray for our archbishop and for all who are involved in the decision making process of the future pastoral and spiritual provision not only in our part of the archdiocese, but across the archdiocese as a whole. Our Lady, Mother of the Church – pray for us! St Joseph, Patron of the Church – pray for us!